Last weekend saw us celebrate mid-February’s unseasonably superb weather (no gloves! suncream!) 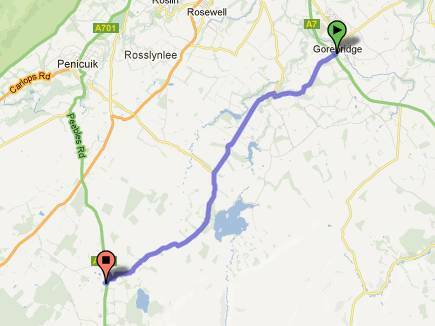 with a cracking ~50 mile circular from Gorebridge to Peebles and back via Innerleithen. 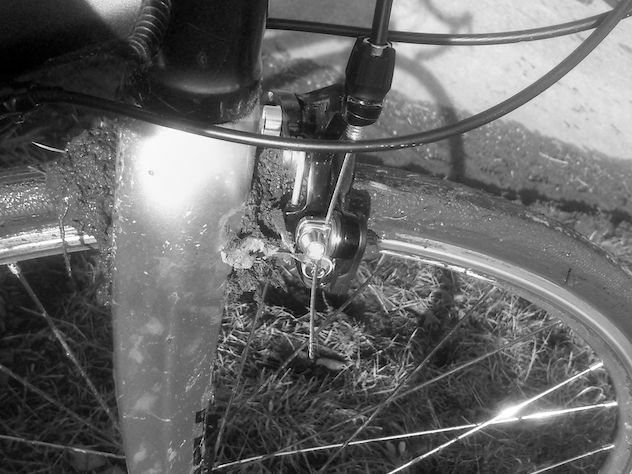 Often rolling, it doesn’t feel particularly hilly – although the total ascent is around 3,000′. 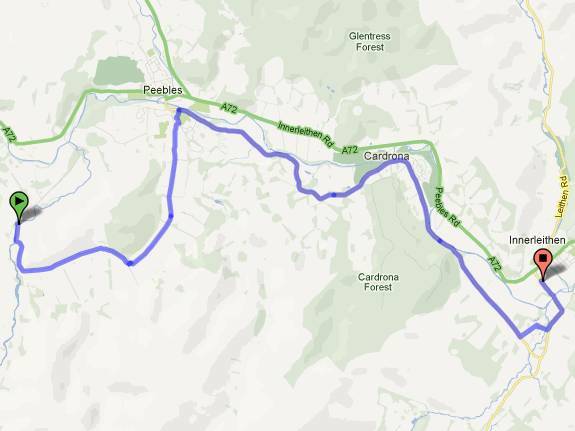 Note: there is a short (2.5 mile) stretch of the A703 Peebles-Edinburgh road, which is OK – well used by cyclists, all things considered – albiet not pleasant. This leaves almost exactly 50 miles of deserted road to enjoy, but if it’s not your thing, I can’t find any ready alternative for this part of the route. 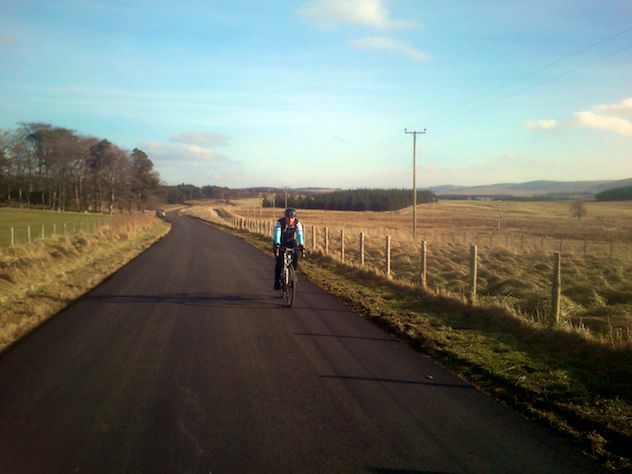 Above: smooth empty roads between Temple and the A703… perfect! Here’s the overview map: a simple route to navigate, heading counter-clockwise for no particular reason. Very quiet roads and plenty of opportunity for cake! A landslip near Temple has closed the minor road for the duration (although it’s easily bypassed by car or bike by heading through the village instead) making the first section of the ride even more super deserted than would otherwise be the case. Apart from the dip down to the river at Temple proper, this whole section is very gentle with no major gradients. The road surface is generally excellent, having been recently relaid for large stretches of the route. 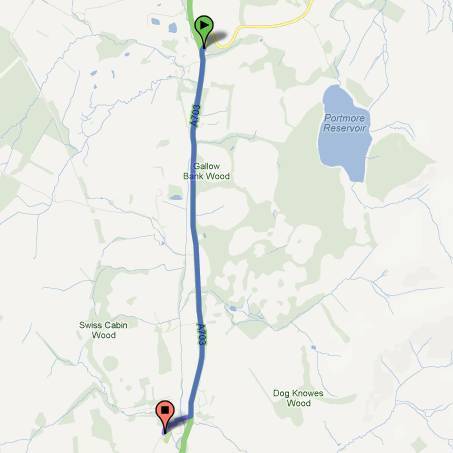 Unfortunately, there’s no ready alternative to the A703 if you want to head in either direction from the end of the minor road. Outside of peak times, this road is relatively lightly trafficed; I recommend planning the direction of your overall ride so that you would be going south in the morning (while people are driving north into Edinburgh to shop), or would be riding north later on (at the time that they’re all driving home). Ten minutes of gritted teeth will see you to the exit at the village of Eddlestone. From the picturesque village of Eddlestone a minor road heads south-west, meeting the A72 a couple of miles west of Peebles. A fair climb but steady, you will be rewarded for your efforts with a fantastic zoom downhill on a narrow, winding road. 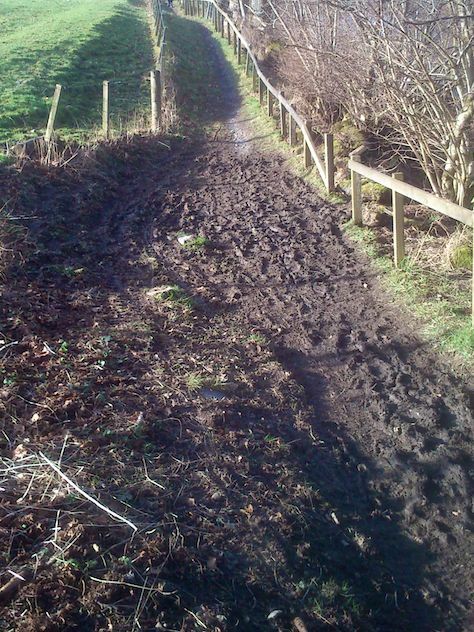 There is some farm traffic on the ascent, with accompanying mud, but otherwise this section is a dream to ride. 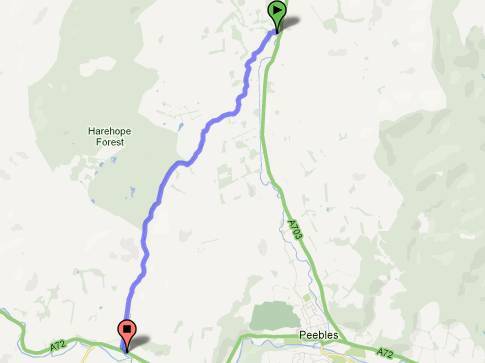 If you don’t mind a bit more traffic and want an easy life, you can just proceed along the A72 directly to Peebles. 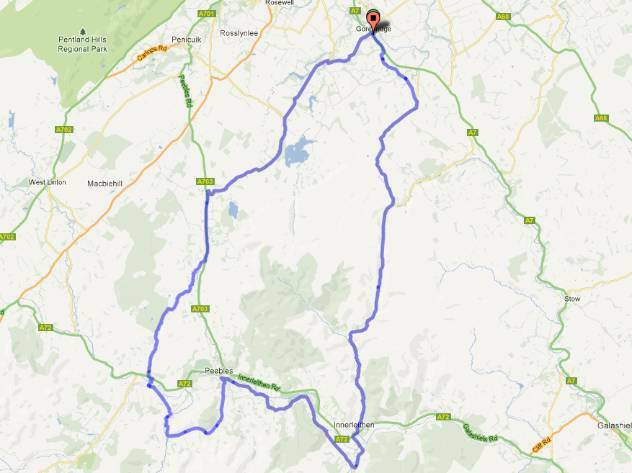 The alternative is to cross the river and enjoy the superb road around Cademuir Hill, bringing you in to the quiet south of the town on a lovely stretch of road. There are two bridges facilitating this access. The closest is the (signposted) cycle route “border loop 82″, which crosses on a footbridge immediately south of your current location. 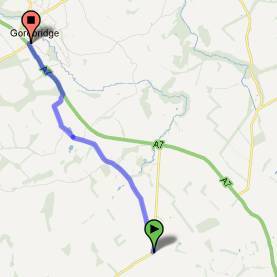 The other option is to proceed along the A72 for a short distance before crossing on a standard minor road. 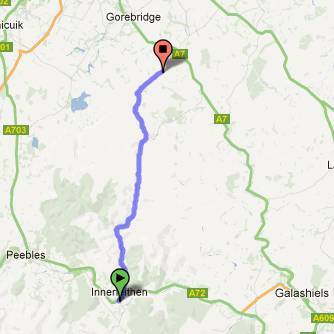 However you get to Peebles, you face a choice. You can either ‘enjoy’ the ferociously busy High Street or ignore the whole town and head to picturesque Innerleithen for refreshments instead. This was the option we went for! 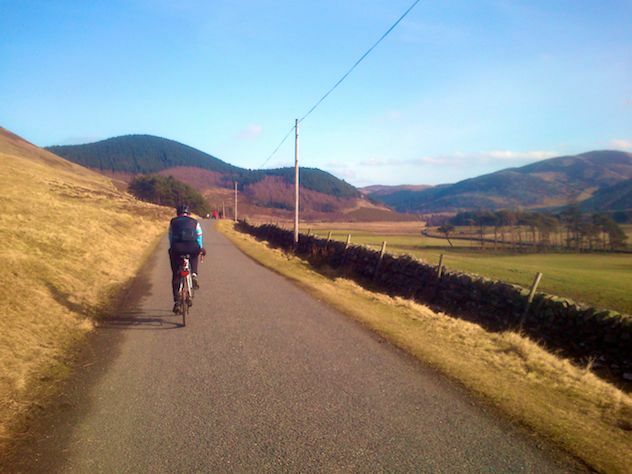 Below, see the end of the loop around Cademuir Hill before riding along the quiet B7062 to Innerleithen. This is another really nice stretch of road, very light traffic and just lumpy enough to keep your interest. 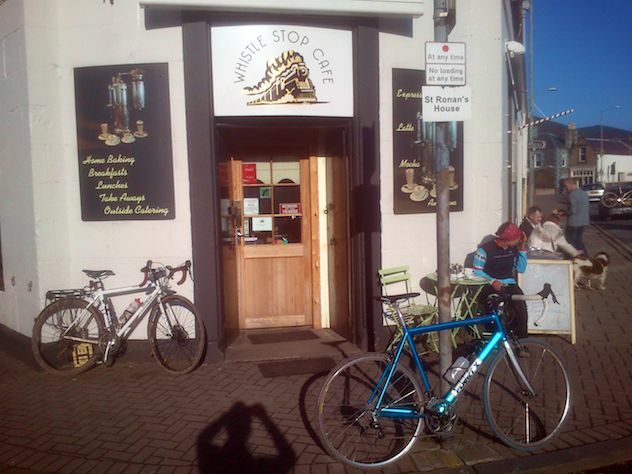 In no time at all you will arrive at the superb Whistle Stop Cafe in Innerleithen, which does a fantastic made-to-order BLT and a fearsome selection of baking in cyclist-sized portions! The prevailing wind from the southwest makes it a good bet that you’ll enjoy going north on this road more than going south, but either will work when the day is as nice as this! As you finish descending, avoid the default option of joining the A7 with the B7007. 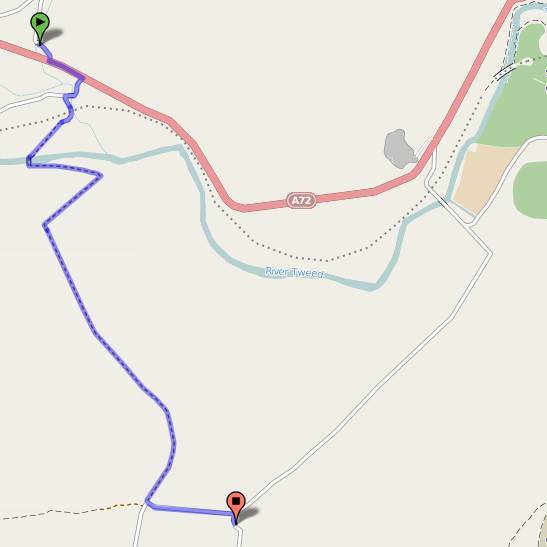 Instead, turn left for Middleton (now following the NCN1 signage) and you can either cross the A7 towards Borthwick Castle, keep on the west side of it until you hit the crossroads, or pop onto the A7 for literally a few hundred meters to finish. What a fantastic afternoon out! I was enjoying the same weather on the Tour of East Lothian Audax. A longer variation on your route, avoiding the A703 almost entirely, is via the Roman road over to West Linton – another fabulously quiet road. The section which turns off from your route is a fab piece of road with great views of the Pentlands. That’s a nice looking extension and not one I’ve ridden before (all audaxes seem to go straight down the A701). one of those rides that puts both the body and the soul in a good place! Actually today it is impassable due to significant snowfall! Ah springtime in Scotland! 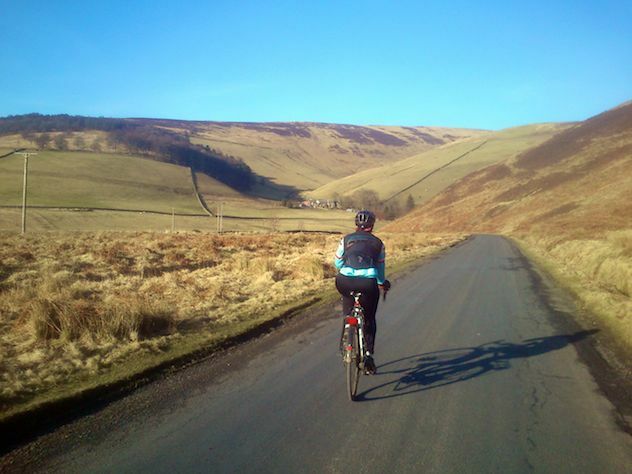 Take a right a mile or so further along just past Temple Farm/riding stables which will take you along the shores of Gladhouse Reservoir and then join the road toward Peebles. Or instead of turning here continue further on for a few miles to a T junction: left will take you along the backroads to the Granites ; right will again join with the Gladhouse road. One of those wee roads where you feel you are more likely to meet a UFO than a car ! only downside is often a lot of stones on the road,deposited there by tractor wheels picking them up with mud in the fields? Incidentally if you ever stop at the top of the Granites,just before the Borders Region sign, there is rather a touching discreet memorial stone on the right only about a foot high ( looks rather like a small hydrant marker) erected by the cycling buddies of a deceased companion who loved to cycle this route.